You see the message “No Update Required. Your WordPress database is already up-to-date” You press “Continue” but instead of going to the login screen you find yourself on the home page. It’s a loop. Memcache on your server is likely the cause and needs flushing. Memcache speeds up database calls by storing data in the server’s RAM to reduce the number of times a database is queried. If your host is SiteGround (the Grow Big or Go Geek plans) you can login to your cPanel go to SuperCacher and “flush” your Memcache there. 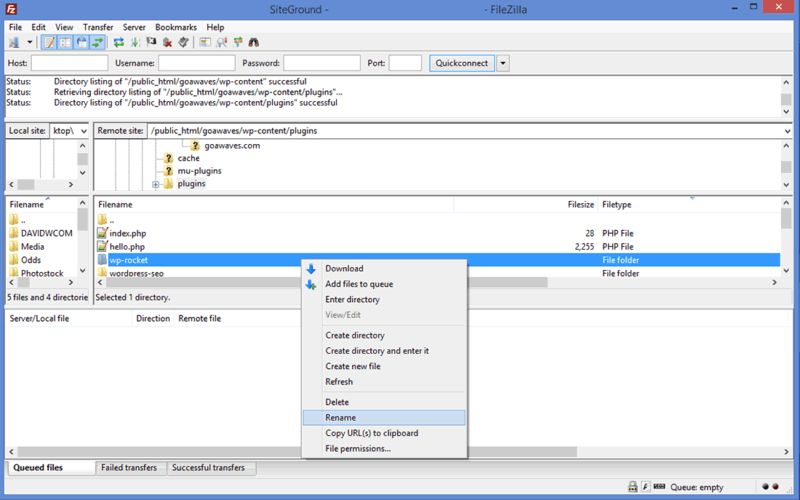 Memcache is generally not available on shared hosting, but it is with SiteGround. If you don’t have Memcache try disabling any caching programs you have via an ftp program (like FileZilla) by going to /public_html/wp-content/plugins/your cache program and rename the folder. You do this by right clicking on the folder (as below) and add a digit to the end of the folder name. My caching program here is WP Rocket, but you may have something like the popular WP Cache or W3 Total Cache plugins. You could also rename the entire plugins folder if you think other plugins could also be caching. Finally you could try manually uploading a fresh install of WordPress via ftp. You only need to drag the unzipped WordPress folder to the root of your site and allow all overwriting when prompted. Failing this it could be time to call your hosting company. Thanks a lot. Flushing the cache on SiteGround did the trick! Same here. It worked on my blog. Thanks. Whoops – sorry Carolyn. I missed this. Thanks for letting me know. Hi David, the Siteground flush did the job – thanks for your help. Superb. Siteground user – solved the problem in 20 seconds thanks to your post. Thanks, this was a great help. I upgraded to WordPress 5 the other day, and the first thing I saw was the seemingly infinite loop telling me my WordPress was already up-to-date. I’m not a WordPress expert, so this was extremely worrisome. I found your post, and since I’m a Siteground user, I flushed the three levels of cache in the “Supercacher”, and then my site was back to normal. Thank you David, you saved me a lot of troubleshooting time! Cheers! Thanks, it was really that easy – and NOTHING is ever that easy! Thank you! So easy and it’s fixed now. I had the same issue but not related to Memcache. The cause turned out to be the W3 Total Cache plugin. I deleted the files inside the wp-content/cache folder, that solved the problem. No deactivation of plugins was necessary. Thanks, Christoph. Good problem-solving. W3 Total Cache was always too much for me.